I enjoy collecting and doing vintage quilling. It doesn't matter much what, I collect kits, books, advertisements, old order forms, everything having to do with quilling back in the 70's and 80's. 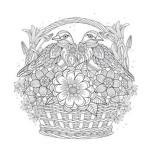 We have our own site with pictures of vintage quilling kits, advertisements, and more. I've been quilling since I was 5 or 6 (over 48 years). My Aunt Emgart (who was the girlfriend of my Uncle Heinz) taught me when I stayed with her. I loved quilling. Even though there wasn't a lot of paper choices and she was a hard teacher, I loved the smell of the paper, the way it felt and how I could take a strip of paper and create anything!! I continued to quill even when I was in the Army! I got really good and sold several pieces I created and even started making my own patterns and designs (I love making abstract quilling pieces). One of my favorite quilling gurus is Trees Tra. 11 years ago I got TOS (Thoracic Outlet Syndrome) which is a repetetive motion disorder. I got it from working at a hotel reservation center (too much typing LOL). Suddenly I couldn't quill any longer and Gene, my husband watched me sink deeper and deeper into depression. He watched me try and quill but I could no longer hold the paper and my coils looked like they had been made by a child of 1! to make matters worse I developed other disorders including Fibromyalgia. Sadly, I gathered up my quilling stuff to get rid of it but Gene said to hold off and asked me to show him how to quill. He learned quickly and once he understood what was needed, he created a bunch of tools so I could continue to quill. And that's how the store came into being. 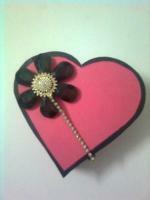 I'm really lucky that I'm able to collect vintage quilling and started a group at yahoo called Vintage_Quill. It's not real active yet but hopefully it will grow as others who collect and want to trade or sell vintage quilling join. The best tip I could pass onto a beginner is to practice, practice, practice.....and then practice some more. Although it's fun to create things, it's really important to learn the basics and learn them well if you want your quilling to look professional and for it to be art rather then a hobby/craft. Keep a book with various sizes of your pegs, shaped coils and also pictures of all your projects. When you create a project it's a good idea to write down the directions so you can make it again if you want without having to guess how you created it. I also keep a sampler legend that has all the colors of paper available to me. This helps me when I'm creating a project. It's just something that appeared as I quilled. The hardest part was creating the face. These 3d figures are really easy to make. I'm trying to create hinged arms so they look better. I can tell that this project must have taken you a long time to complete. I wish the photo was a little clearer, but regardless... it's fantastic. Did you have a pattern or did you just envision it and take it from there? Thank you for sharing your story. Your photo isn't showing up I wonder if it was a bit too big? I love your idea of keeping a book with your coils and pictures in it. Gives you something to look back at. I really admire your perseverance over adversity. Good for you! Let nothing come between us and our quilling eh? Join in and write your own page! It's easy to do. How? 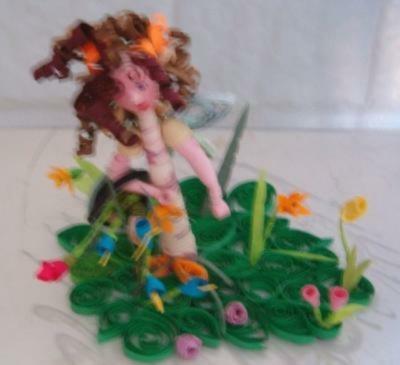 Simply click here to return to Share your Quilling Projects.